I apologize for being tardy with this update… it is certainly not for lack of items to cover. Much to the contrary — despite the holidays, we have been extremely busy, representing Torah values and applying them to current issues. You know that we represent a much-needed voice, and we hope that you will generously support us to amplify our efforts. The Trump Administration noticed our voice in the Jewish community, and our strong support when appointments and policies are favorable towards Torah values. We were invited this year — not only our officers, but members of our Rabbinic Circle and key supporters — to participate in the annual conference call in which the President offers his blessings for a good (Jewish) New Year. Members of our Rabbinic Circle are also now able to join the Administration’s monthly conference calls for faith leaders, due to this recognition. What we believe (or, we would argue, simply acknowledge) is that the Trump Administration frequently promotes, as mentioned above, “appointments and policies [which] are favorable towards Torah values.” This is not only true regarding Israel, although Israeli confidence in the President approaches 70%. In a recent poll of the Orthodox community here in America, over 91% responded that they were satisfied or very satisfied with President Trump — which is both the highest approval rating for any demographic group (to our knowledge), and quite the opposite of what is heard from the Jewish left. 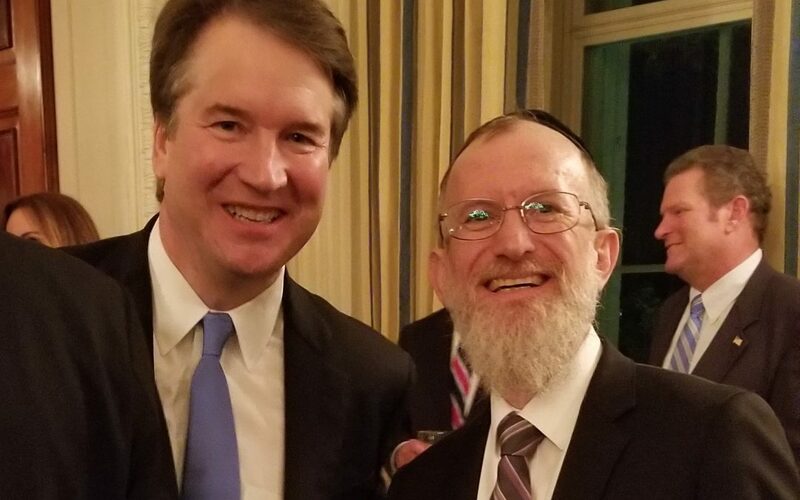 The nomination of Judge Brett Kavanaugh to the Supreme Court was a good example of the gap between our positions and those of liberal Jewish organizations. Our outlook towards Justice Kavanaugh’s confirmation was similar to that of Justice Neil Gorsuch, which we also endorsed. In both cases, we saw prolific judges who emphasized the protection of religious liberty, and who limited their role to that of impartial arbiters of the Constitutionality of laws and their application, rather than viewing themselves as able to impose their personal opinions upon the Constitution and society. With regards to the later accusation of wrongdoing, we felt the process was unfair, unduly tarnished his reputation, and in the end did not justify changing our previous opinion. As some on the left attacked him in the name of Judaism, we felt it necessary to respond. In recognition of our unique, positive Jewish voice, we were invited by the White House to be represented at the swearing-in ceremony. I was honored to attend. At this writing, the General Assembly of the Jewish Federations of North America is concluding in Tel Aviv. In late July, we sent a letter to the JFNA President and CEO Jerry Silverman, as well as the co-chairmen of the GA, pointing out that the agenda for this purported dialogue seemed to be extremely one-sided on many issues — it appeared to be merely an opportunity for American Jews to promote their opinions on how Israel ought to function. We requested a meeting to address this issue, but when there was no response to that request, we then issued a press release regarding the problem with the GA’s apparent agenda. Although the CJV focuses upon America and American public policy, we feel obligated to speak up when American liberal Jewish groups presume to intervene in Israel’s internal affairs, whether in regards to Jewish religious activities, Israel’s security needs, or its democratic government. Our President, Rabbi Pesach Lerner, sent our letter and release to many opinion makers, and several writers followed suit with their own op-eds, notably Caroline Glick, Isi Liebler, and Leah Aharoni of the pro-tradition Women For the Wall, all of whom focused upon different aspects of the same core flaw with the GA program. Rabbi Lerner and Rabbi Yoel Schonfeld, CJV Vice President, also strongly encouraged the Am Echad organization to involve themselves — which they did, with a full page ad in Haaretz and the Jerusalem Post, accompanied by a media campaign. Am Echad is a group created by Agudath Israel, representing the American Orthodox community’s positions in Israel’s religious affairs. In addition to a flurry of other op-eds on this issue both the Orthodox, American Hamodia and the secular, Israeli Jerusalem Post devoted editorials to the lack of true dialogue at the General Assembly. 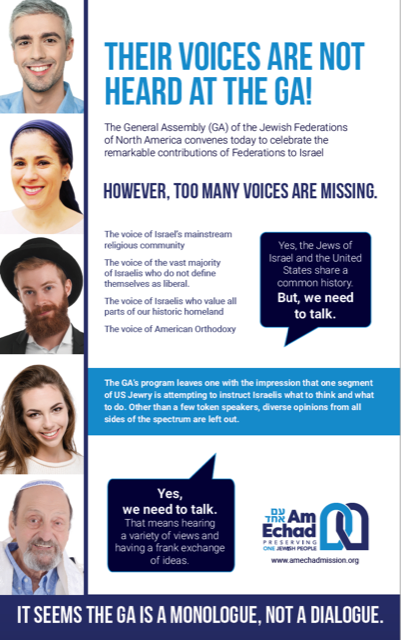 The JTA asked “which Israelis, and to what end?” — in a piece that attributed to us the idea that “when the GA talked about American Jews, what it really meant was non-Orthodox Jews. ” The lack of real dialogue, featuring different opinions, became perhaps the predominant narrative regarding this year’s GA, and the CJV is justifiably proud of our role in bringing this about. In addition to the above, we are finding ourselves frequently consulted to provide an alternate Jewish voice. We were asked to make a statement on euthanasia/assisted suicide due to current legislative efforts in New Jersey and elsewhere, and to provide further elaboration of our position on abortion for a pro-life group which lacked a Jewish perspective. We were also asked by COLPA, the National Jewish Commission On Law And Public Affairs, to join other Orthodox organizations in an amicus curiae brief to the Supreme Court, in which we request that the court overturn a precedent that requires only “minimum accommodation” of the religious observance of employees, which limited a key provision of the 1964 Civil Rights Act. We were also consulted by the Heritage Foundation, one of the largest and most influential public policy organizations in the country, due to suppression of the ability of religious foster care agencies to serve religious populations. In an environment where there are insufficient foster families to serve the number of children waiting for homes, certain groups have successfully petitioned state governments to refuse certification to religious foster care agencies. The fact that a particular agency will only place a child in a family engaged in a traditional marriage, or will give preference to a Catholic family to host a child with Catholic parents, in no way limits the ability of any intended foster couple to work with a different agency. On the contrary, it provides more agencies able to recruit more couples to serve the children waiting to be helped. This is, of course, of great concern to the Jewish community, as one of our core beliefs is that a child of Jewish parentage should be raised in the Jewish faith. In the end, we were able to connect the Heritage Foundation with one of the unheralded agencies that focuses upon the needs of Jewish children — a connection that could not have been made without our help. OK, Now It’s Really ‘I’m Spartacus’ Time! All in all, the Coalition for Jewish Values continues on an amazing journey. We knew we were needed, but did not know the response would be so quick and so positive. We sincerely appreciate your generous support to continue to grow and advance our crucial work.